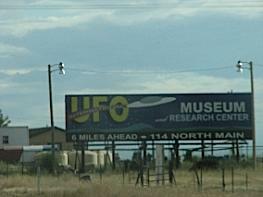 There is a ton of information on alien sightings and theories at the UFO Museum & Research Center in Roswell, New Mexico. In October 2008, we went on a field trip there and read a lot of neat articles, too. I didn't see any real solid evidence there that aliens do exist, however all the articles of reported sightings were really neat to see. My class went on this field trip because we were studying astronomy, and our teacher wanted to cover our questions about life on other planets. It was a really cool experience. They showed us a neat video in the video room, there is a neat souvenir shop there, and we all really enjoyed looking at all the articles and displays that were set up. I've often wondered if they really do exist. Had no idea there was a museum out there.